Like any plant, those grown in a hydroponic setting require support and water. Because of the name, many of those new to hydroponics will arrive thinking that plants are always grown in water. That is certainly done, but there are many other choices for media. Hydroponics is really just soil-less plant growing, with some other substance providing the support and nutrients fed in other ways than through earth. One of the most popular choices is a material called rockwool. It’s a type of basalt that is specially processed to provide a strong, porous base. It’s mostly inert, so it won’t decay or leach compounds into the water very much. Since it’s porous, it provides good drainage. It’s also lightweight and inexpensive. Rockwool cubes are often used but small slabs are also available. Pre-drilled holes allow for placing and growing seeds and any cubes containing plants that don’t survive can be easily removed. The cube can be cleaned and replaced with another seed to try again, or simply left out to provide additional space for the survivors. This way, the hydroponics tray can be regulated easily so that there are a limited number of plants competing for air, light, space and nutrients. Despite its lightweight and porous nature, rockwool provides a very sturdy medium for growing plants. It gives good support to developing roots. At the same time it helps regulate the water temperature by being a good heat conductor. Adding rockwool will alter the pH of the environment slightly at first, but this is easily controlled using a pH kit. Though rockwool has many advantages for a hydroponic gardener, most everyone will want to experiment with different media at some time. There are many more options available. Ordinary beach sand is one common medium. It drains well compared to ordinary clay-infused soil, but in a hydroponic setting it doesn’t do as well as most other possible media. But it’s extremely easy to use and certain plants take to living in sand very well. Certain orchid species in the wild, for example, grow naturally in wet sand. Ordinary aquarium gravel is used in some settings. It provides a strong, clean supporting medium that can also be attractive. But it can crumble and so will have to be cleaned and filtered well before use. Because it’s very heavy, a good pump will be required to keep air and water flowing through the system properly. Otherwise, plant roots may dry out. LECA rock pellets is also used. Perlite is a more popular alternative. It’s a type of volcanic rock that is heated to form small, lightweight pebbles resembling glass beads. It’s desirable for its ability to retain air. Since hydroponically grown plants will quickly deplete any dissolved oxygen, perlite will help the pump keep the water oxygenated. Vermiculite is similar to perlite. 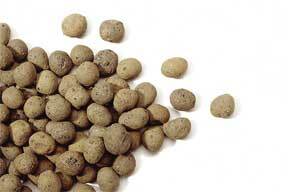 It, too, is made into small pebbles to provide a flexible supporting medium for hydroponic plants. It draws in water from passive systems by capillary action, helping automate the watering and nutrient feeding tasks. Since it holds even more water than perlite it may exclude air so it needs to be used in moderation. A mixture of perlite and vermiculite is often used for that reason. Try different options. Experiment. Hydroponics is supposed to be fun!